Orrin Woodward and Chris Brady Brainstorm, TEAM | Today's The Day!!! This is so good, I think it was Wooden who said if we strive for perfection we will never make it but we will reach excellence. Its so great the Chris and Orrin have provided a way to stive for perfection and reach excellence with the LIFE business! Great post Holger! 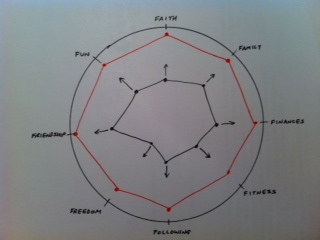 I wad sharing this idea with someone today and I used this diagram above as a way to describe how and why we are creating a culture around the 8F’s It made me look like I wad incredibly intelligent, but little did this gentleman know I stole it from a couple geniuses (literally) like Orrin Woodward and Chris Brady. Thanks for all your wisdom and insure Holger! You are truly making a difference! Thanks for posting this Holger!! I actually used this model the other day when explaining to another professional what it is that Team LIFE is all about. It was by for the most effective way to help people understand the genius behind Orrin Woodward and Chris Brady for sure! Gosh, what great hope we have for a better tomorrow thanks to the founders of LIFE! Onward to 1 Million People! Excellent post Holger! I loved how you can use this wheel to check where you are in your life through the 8 f’s. I love the term Circle of Life! Not only does it represent our wonderful business LIFE, but when I hear circle of life outside our business, I think ‘the way things work to make one whole’ as in everything is all connected together. In order to make a master painting, you need to have all the individual colors in the right spot to the right dynamic of color. Well in our Circle of LIFE, if you have all your 8 f’s at the right dynamic, they will all work together to have the LIFE you’ve always wanted! Thanks again Holger for your leadership! TTD!!! Great stuff Holger! What a great visual to help us all identify where to focus on our development journey. Thanks for your leadership! Thanks for the info, Holger! Thanks for helping us continue to round out our wheel so we can “roll” with less bumps along the journey. Your dedication to us and your team for all these years is so inspiring. Geat info. I will start using the wheel when I’m talking to people of interest. Simply want to say your article is as astounding. The clarity in your post is simply cool and i can assuime you are an expert on this subject. Well with your permission let me to grab your feed to kesep uup tto date wirh forthcoming post.